This afternoon the weather looked iffy for the June 4 candlelight vigil at Victoria Park, and it did pour for a while. It was much needed rain after weeks of scorching heat. By 6.30pm the rain had stopped, which was promising and by 7pm the thunderstorm warning expired. YTSL, and another friend and I met up in Causeway Bay and we walked towards Victoria Park. Along the way the usual political parties were there canvassing for money, including Joshua Wong Chi-fung for Demosisto, and Leung Kwok-hung of the League of Social Democrats got to the point -- "Put the money here!" he said, pointing to the donation box. Lots of people handed out flyers for things that were June 4th related, until we finally reached the entrance to Victoria Park and finally got a program for the evening's events. 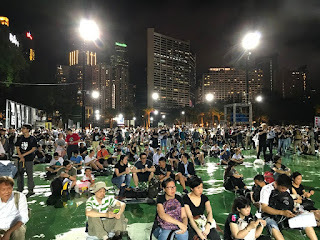 However, the sight looked grim -- the football pitches were empty and when we filed in around 7.20pm, we were in the first section already -- usually we would have been in the second one. Nevertheless there was a good breeze so temperature-wise it was perfect, and it also started drying up the pitches so that by the time the event started just after 8pm, most of us had the chance to sit on the ground. The seniors were the smart ones this year -- many came armed with stools and portable chairs. Some brought plastic sheets to sit on and we saw one woman with bubble wrap! Have to remember that next time! 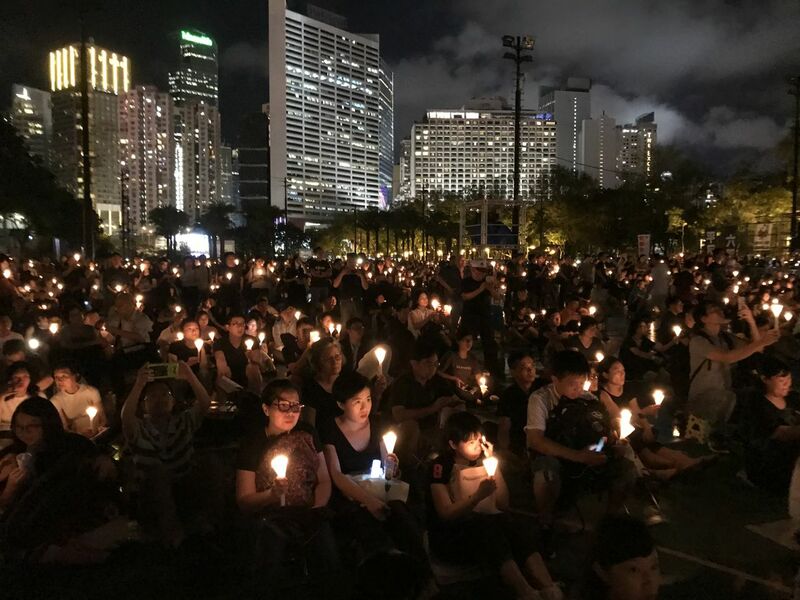 At around 8.09pm the event started, and the program is basically the same each year -- a video featuring chaotic scenes in Tiananmen Square, complete with tanks and soldiers, people running away and others carrying people from the gunfire. Then there are speeches, a floral wreath is presented, the eternal flame lit by young people, and Albert Ho Chun-yan, chairman of the Hong Kong Alliance made a speech. Next a video message from the Tiananmen Mothers. 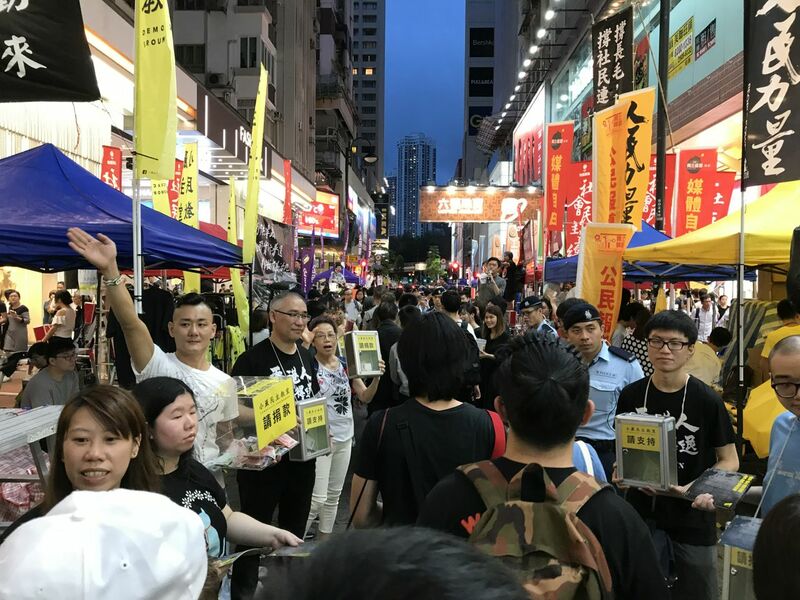 Since 1989, 51 parents of the group have passed away, and they are pleading with the central government to own up to the massacre of their children, and yet they continue to be met with stony silence. They are grateful that people in Hong Kong continue to mark the incident and continue to donate to their cause. 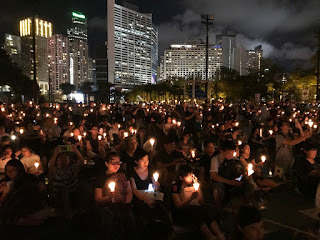 This year there was a remembrance of Liu Xiaobo, the Nobel Laureate who tried to get the students get away from the incoming tanks in Tiananmen Square. He died last July, which is why this is the first year his passing was marked at tonight's event. 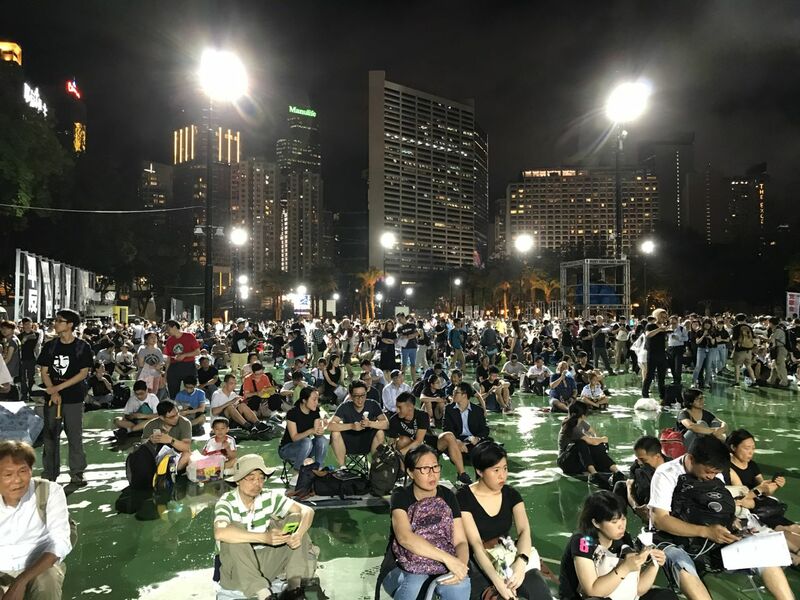 In a video, empty chairs were placed in different places in Hong Kong, an echo of the Nobel prize ceremony where there was an empty chair where he should have sat. Organizers estimate 100,000 to 150,000 people showed up this year despite university student unions boycotting for a fourth year in a row. 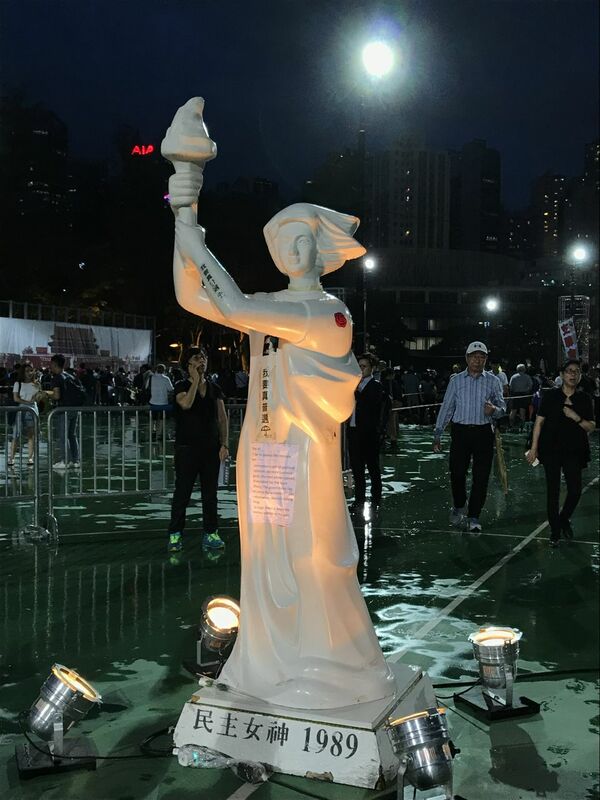 They claim there is no point in fighting for democracy in China when we should be advocating democracy in Hong Kong. However, Dr Chan Kin-man, co-founder of the Occupy Movement and sociologist at Chinese University, sent an open message to the students who stayed away, saying they can call themselves a Chinese or a Hongkonger, but they should be human beings first, which got a big applause from the audience. Next year will be the big 3-0. It will definitely get a lot of media attention, and more importantly hopefully more people will come out! And yes remember to bring better seat options!